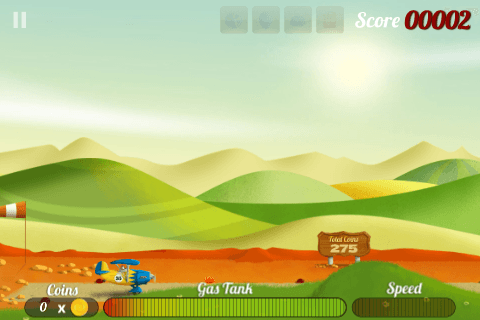 Tiny Plane falls into the incredibly popular category of game based around cute cartoon character that is trying to gather as many coins, fruit and bonuses and avoid bad stuff. This is literally one of the biggest genres in the App Store, and it’s not hard to see why. Cute, addictive, cheap. It covers all the good bases that apps provide as an alternative to mainstream games. So it goes to say that each app that follows this formula needs to have something that puts it ahead of the others, something that makes it more addictive, more cute, just more. Does Tiny Plane accomplish that? The controls are, as is to be expected, incredibly simple. You tap on the left corner and it makes your plane go higher, on the right makes it dip down. 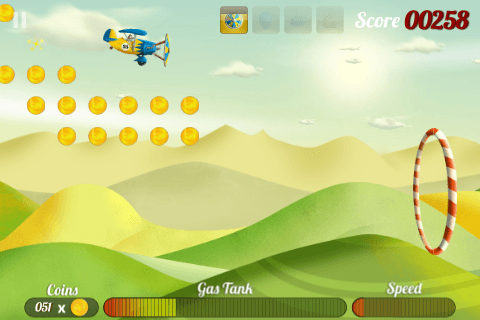 It is similar to all of those plane/helicopter games where you have to guide it through obstacles and collect bonuses. Except instead of traversing a dangerous cavern it’s an open world to explore with the ability to go as high as you’d like. Well, except for the fact that you need fuel. And, in most cases, you will need to land to get it. Unless you happen across some fuel cans floating in the sky, which is always handy. Landing is something that you need to get the hang of, and for the first couple times instead of landing smoothly I just nosedived into a fiery crash. The point is slow and steady and gliding in to a landing. Just a tip for those who are having issue with this, try doing it when your plane’s going slowly and has just about used up all the fuel. There are two gauges at the bottom of the screen, one for the amount of fuel that you have, the other measuring the speed. For speed you can gather pieces of fruit that will make you go faster, hence lengthening the amount of time you can spend airborne, and there are also hoops that give you a super charged boost. Often scoring these will help shoot you through a bunch of obstacles without too much issue, and I found myself accidentally dodging a lot of them by accident. There are mines and homing missiles that zoom up behind you so it really is best to keep moving. The warning system really is your best friend, letting you know when there are things coming up, and at what level on your screen, and also warning you when a missile is closing in on you from behind. 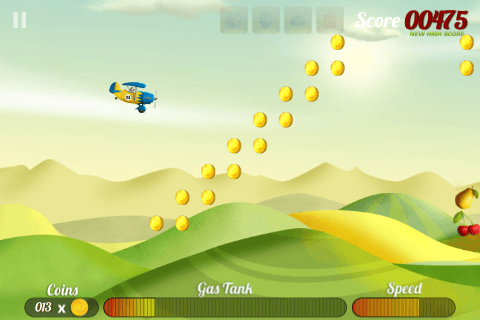 At first the warning system is quite easy, warning you of little storms that drain your coins, but when your plane speeds up and the sky starts getting full of mines, it becomes far more of a requirement. 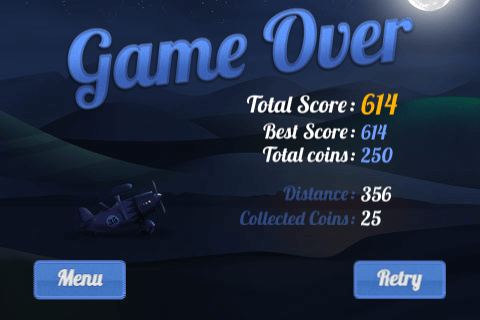 Tiny Plane is one of those games that are really easy to pick up and become that game that you play at random when you have nothing else to do and have some time to waste. The fact that it can be done in short bursts is another quality that belongs to this casual App genre, and it fulfills this easy, casual quality to a tee. Tiny Plane is super cute, I mean the main character is a dog pilot. Even the way the instructions are styled is great, I mean they’re on a fake newspaper! Sure it doesn’t make it easy to absorb all the information at once, but it’s pretty damn awesome. The soundtrack sounds like it’s straight from a kids’ cartoon. It goes really well with the cartoon style of the game, and totally adds to the experience of the whole game. I didn’t find myself turning it down, or off, at any point because it just fit the whole thing so well that I really enjoyed having it in the background, as if it was narrating the whole experience. 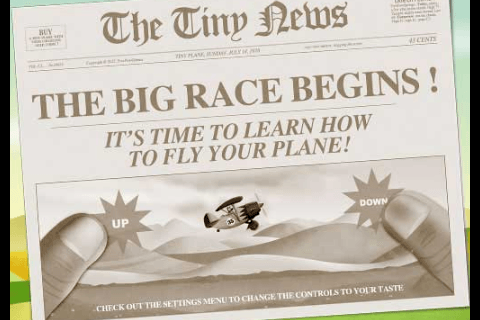 Tiny Plane is just a game that you end up hunched over, concentrating really hard on small cartoon characters and end up yelling at people if they distract you. It certainly has the addictive part down, but it doesn’t really set itself apart that much. It is one of those games you get addicted to and play all the time, until the next app that comes along for you to get addicted to. That isn’t saying anything bad about it, and chances are you will enjoy it while you play it, but it probably won’t have the longest shelf life on your iDevice.